Plants creeping, red, delicate, up to 5 cm long. Blades ribbon-like, up to 3 mm wide, usually pointed at tips, attached by rhizoids (often near margins). Branching from margins (irregular to pinnate), branches sometimes ending in hooked or sickle-shaped tips (hamifera). 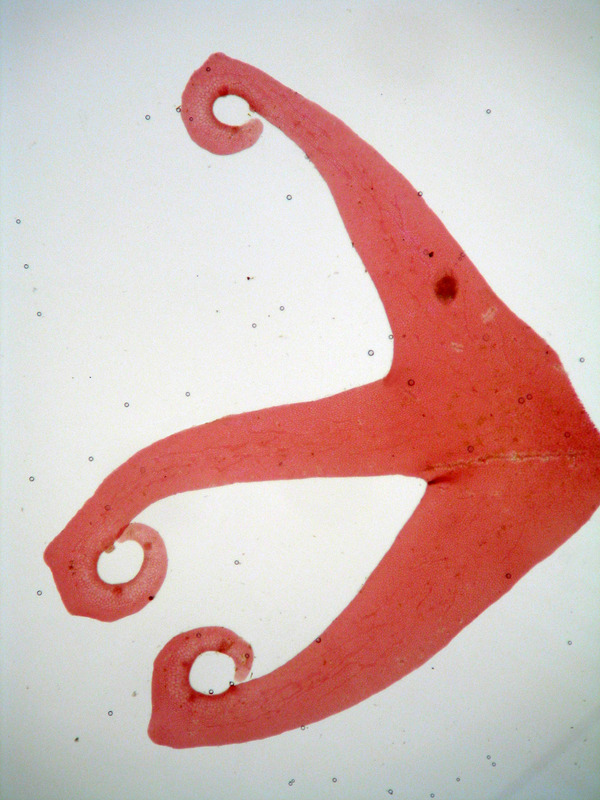 Thallus monostromatic except at microscopic veins and inner curves of hooked apices, where there may be up to 3 cell layers. In surface view cells polygonal, 40-60 µm diameter in central parts of thallus. Tetrasporangial sori circular, sub-marginal; sexual structures not seen. Found from the southern Cape Peninsula to northern Kwazulu-Natal (16-49). Common from the sublittoral fringe to at least 35 m depth. Often epiphytic or entangled with other algae. World distribution: widespread in temperate and tropical seas. Type locality: King George Sound, Western Australia (Womersley 2003). Note: A. ciliolatum includes two species previously recognized from South Africa: A. uncinatum and A. venulosum (see Womersley 2003). Essentially, this species includes all of those with hooked apices (De Clerck et al. 2005). Acrosorium ciliolatum, showing hooked tips. Acrosorium ciliolatum, habit, lower plant tetrasporangial. Reproduced from Stegenga et al. (1997)( as A. venulosum). De Clerck O, Tronchin E. M., Schils T. 2005. Red algae. In: De Clerck O., J.J.Bolton, R. J. Anderson & E. Coppejans, 2005. Guide to the Seaweeds of Kwazulu-Natal. National Botanic Garden of Belgium, Brussels (Scripta Botanica Belgica), pp. 130-269. Kylin H. 1924. Studien über Delesseriaceeen. Lunds Universitets Årsskrift, N.F. Avd 2, 20 (6): 1-111. 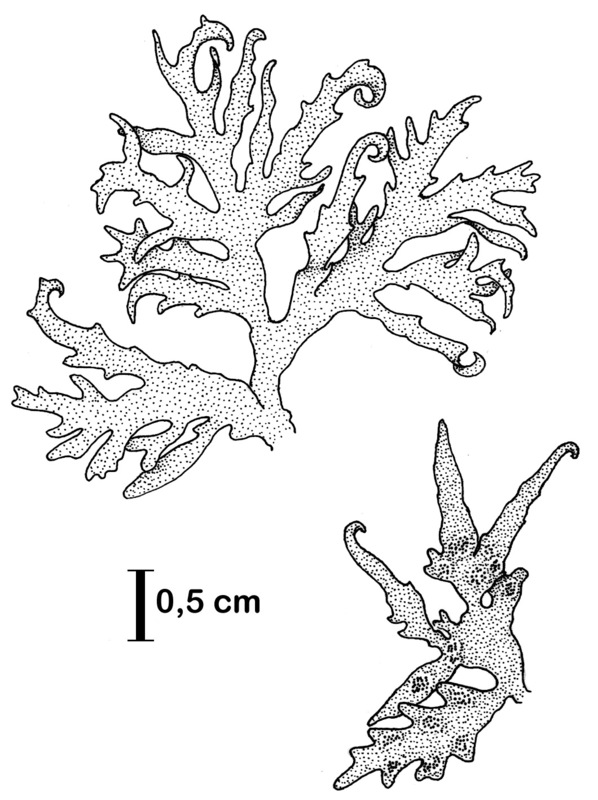 Womersley, H. B. S. 2003 The Marine Benthic Flora of Southern Australia. Part IIID. Canberra, Australia.